While everyone else is shelling out 30 euros for un brunch, we’ve developed a Sunday morning tradition of our own. Mon mari and I wake up at noon, have a coffee, take the granny cart to the market and pick up some fixings for our Sunday sauerkraut lunch. 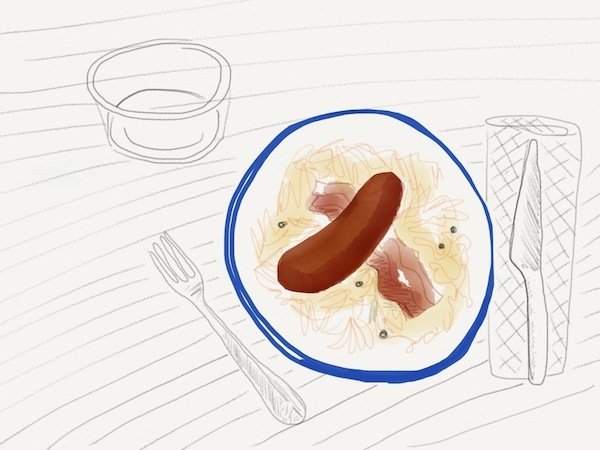 I leave mon mari to pick out the porky add-ons, a smoky morteau sausage and thick-cut bacon for two. I do not think we are the only ones either. Each butcher at the market has a steaming vat of choucroute, often disappearing before we late risers arrive. High-energy food for a low-energy afternoon. P.S. By the way, sauerkraut with fish is a surf and turf revelation! P.P.S. Find my illustrations on my friend Meg’s blog here. P.P.P.S. This illustration was made with my new Paper application for the ipad. Yes, you have certainly got treats of your own in Provence. How do you usually spend your Sunday mornings? Sounds fun & romantic, and you are making me miss our Sunday mornings in Paris. Although with les marchés here in Provence, we are spoiled with local goodies galore! Will have to try your idea. Merci! Et bon dimanche!